Some bands would find it difficult to raise the energy level for a lunchtime show, but Fumaça Preta had no problems in hyping up the audience of Rough Trade East with their animalistic funk. 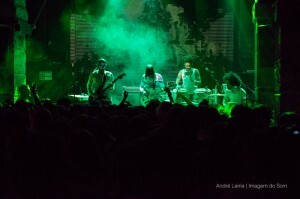 In a short set, they showcased their unique music style and its variety, veering from heavy rock to punchy, soulful ballads. They opened with Vou Me Libertar, which lept right into their wild and carefree sound, immediately setting the tone. The apt title, which translates to “I will set me free”, encouraged the audience to get loose with them, to let go and fully embrace the performance. Tire Sua Máscara slowed things down and added a sensual undercurrent running through, which showed their range. It frequently stopped suddenly, which created anticipation for the music to start up again. It also allowed for an intense guitar solo that wandered off a bit into its own world. This sums up perfectly what these talented musicians create: a free-flowing, meandering psychedelic journey that explores various avenues in its quest for musical freedom. They ended the show with a special song for the season, entitled Christmas, which was definitely a distinctive take on a Christmas song. It also showed their sense of humour, which was present throughout the performance, beginning with traditional bells before bursting into heavy drum beats. Meaning black smoke, Fumaça Preta lived up to their name with a heavy, husky sound that, once cleared, gave way to sharp, affronting wildness. They had an unusual set-up, with the lead singer also on drums, a wide selection of percussion including bongos and a triangle, and the lead guitarist occasionally hopping onto the keyboards. It was a new arrangement for practically every song, which brought out different elements of their sound. Starting as an experiment in a tiny studio at the back of a house in Amsterdam, the band has developed into a strong unit. Their musical influences are apparent in the Latin and African drumlines that accompany the psychedelic trip the guitars are on, and they all merge to form an unusual but engaging musical melting pot. For further information about Fumaça Preta and future events visit here.